It's amazing the way the birth of a child can leave a mark on our hearts and touch our lives in a way that's as unique as the swirled lines that make up each tiny fingerprint. Inspired by her own sons' curious hands leaving smudgy prints across every surface in her home, Kaleen Wolfe's tender pendant captures those messy little hands we can't help but love before they grow bigger. 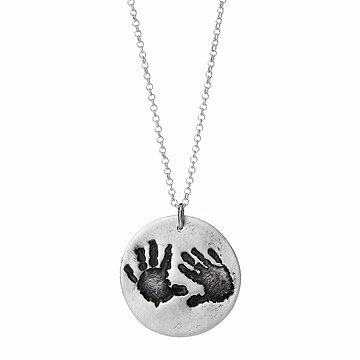 Using a scanned image of your child or grandchild's palms, she handcasts their unique handprints on a canvas of recycled sterling silver. To further sweeten this touching gift, a handcrafted rubber stamp customized to the same scanned prints is also included with your charm, so you can bring a little something extra to every holiday, get-well-soon, or just-because card or carefully wrapped gift. Handmade in Pennsylvania. "One of my favorite parts of creating jewelry is working intimately with my clients to make their visions a reality," says Kaleen Wolfe. Her evolution from jewelry admirer to jewelry artist began with a beading class she took with her mother. Inspired by creating wearable art, she began crafting keepsake jewelry in her Pennsylvania studio. For her son's first Christmas, Kaleen gave custom fingerprint necklaces to her family. Soon, she began receiving requests from friends for their own custom jewelry and she's been creating ever since. Care: Polish with a dry cotton cloth (avoid tarnish removing cleaner). Avoid exposure to moisture and chemicals. When not being worn, store in the cellophane bag with anti-tarnish square, which are included. This is a made-to-order item. If you order today your item will ship no later than 7/26/2019. When you get those little hand prints on paper you are thrilled. But when you get this necklace, it is even more special. I was a little worried about the price and the fact that since it is a custom piece I couldn't return it.. but then I received it and loved it. I find that when I wear it I keep rubbing it :) the workmanship is excellent and I would highly recommend buying this for someone special. Love this necklace I gave to my wife for her 1st Mother's Day. It is a perfect size I was expecting it to be smaller but was pleasantly surprised at the size it is not too big or too small. It came with a square to prevent tarnish which is very important to follow care instructions. Absolutely loved the package it came in and the rubber stamp of our daughters handprints !! My husband got this for me for Mother's Day and was absolutely blown away! I love that I have my daughters handprints forever on a necklace. The rubber stamp is small but perfect to stamp on letters. The pendant is the perfect size. Follow the directions because it will tarnish if worn everyday without taking it off ( this did not happen to my necklace but past experiences have taught me) it is a must for first time parents. I am so in love with this and have gotten a lot of compliments on it! Kaleen Wolfe's silver pendant captures those little hands we can't help but love.